Can you name these famous faces? If not, you could be developing early onset Alzheimer's disease. The test: Can you put a name to these faces? Simple tests that measure the ability to recognize and name famous people such as Albert Einstein, Bill Gates, or Oprah Winfrey may help doctors identify early dementia in those 40 to 65 years of age, according to new Northwestern Medicine® research. “These tests also differentiate between recognizing a face and actually naming it, which can help identify the specific type of cognitive impairment a person has,” said study lead author Tamar Gefen, a doctoral candidate in neuropsychology at the Cognitive Neurology and Alzheimer's Disease Center (CNADC) at Northwestern University Feinberg School of Medicine. Gefen did the research in the lab of senior author Emily Rogalski, PhD, assistant research professor at the CNADC. “The famous faces for this study were specifically chosen for their relevance to individuals under age 65, so that the test may be useful for diagnosing dementia in younger individuals,” Rogalski said. An important component of the test is that it distinguishes deficits in remembering the name of a famous person from that of recognizing the same individual, she noted. For the study, 30 people with primary progressive aphasia, a type of early onset dementia that mainly affects language, and 27 people without dementia, all an average age of 62, were given a test. 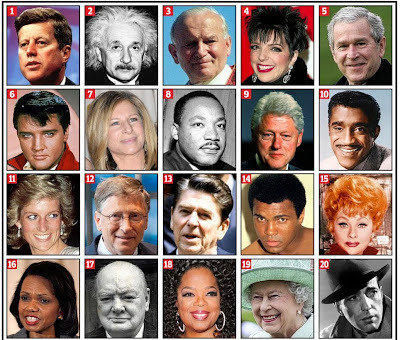 The test includes 20 famous faces printed in black and white, including John F. Kennedy, Lucille Ball, Princess Diana, Martin Luther King Jr., and Elvis Presley. Participants were given points for each face they could name. If the subject could not name the face, he or she was asked to identify the famous person through description. Participants gained more points by providing at least two relevant details about the person. The two groups also underwent MRI brain scans. “In addition to its practical value in helping us identify people with early dementia, this test also may help us understand how the brain works to remember and retrieve its knowledge of words and objects,” Gefen said. The study was supported by grants DC008552 from the National Institute on Deafness and Other Communication Disorders, AG13854 (Alzheimer Disease Core Center) from the National Institute on Aging, 5KL2RR025740 from the National Center for Research Resources, 1R01NS075075-01A1 from the National Institute of Neurological Disorders and Stroke, and the National Center for Research Resources, 5UL1RR025741 from the National Center for Advancing Translational Sciences, grant 8UL1TR000150 all of the National Institutes of Health.